Combining style and comfort, this pet bed has the cutest look of all. Imagine your cat snuggled inside and having their nap. 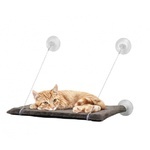 The ultra-soft sleeping surface gives them the warmness and a safe spot to have their nice nap on. Besides an amazing sleeping experience for your pet, we care for you as well by making it easy to care and wash. Ideal for cats and small sized dogs, this cave bed will be their personal bed and the best spot to sleep on. Great price, super roomy!! My baby girl loves it!! Thank u! !